Hon Task Lighting Is Designed To Illuminate Any Work Area, Giving You More Control Over Your Environment. This Table Desk Lamp Swivels Has A Pivoting Head That Rotates A Full 360-Degrees To Bring Light Wherever Needed. The High-Efficiency T5 Bulb Is Designed To Last 50,000 Hours, And Can Be Dimmed From 100% To 10%. The Brushed Nickel Frame Includes A Silver 9'4" Power Cord That Easily Accesses Wall Or Floor Outlets..
Hon Task Lighting Is Designed To Illuminate Any Work Area, Giving You More Control Over Your Environment. 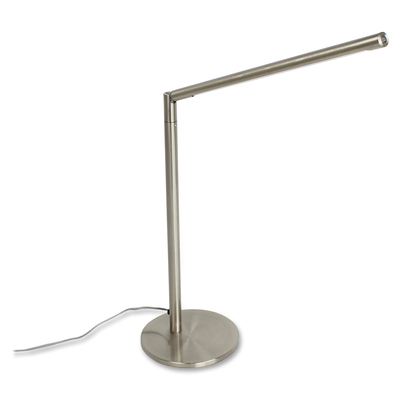 This Table Desk Lamp Swivels Has A Pivoting Head That Rotates A Full 360-Degrees To Bring Light Wherever Needed. The High-Efficiency T5 Bulb Is Designed To Last 50,000 Hours, And Can Be Dimmed From 100% To 10%. The Brushed Nickel Frame Includes A Silver 9'4" Power Cord That Easily Accesses Wall Or Floor Outlets.